But at length, O God, wilt thou not cast Death and hell into the lake of Fire—even into Thine own consuming self? Then indeed wilt thou be all in all. For then our poor brothers and sisters shall have been burnt clean and brought home. For if their moans would turn heaven for us into hell, shall a man be more merciful than God? Shall, of all his glories, God’s mercy alone not be infinite? 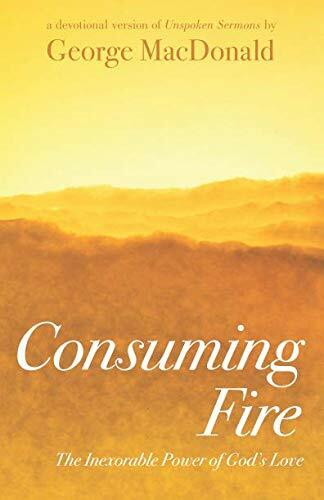 The consuming fire is just the original, the active form of Purity, that which makes pure, that which is indeed Love, the creative energy of God. How much could Moses have understood, if he had seen the face instead of the back of that form which passed the cleft of the rock amidst the thunderous vapors of Sinai? ....this very revelation of fire is itself......a symbol which needed not to be superseded, only unfolded....which would at length make them see that evil, and not fire, is the fearful thing. For he regards men not merely as they are, but as they shall be; and not merely as they shall be, but as they are now growing, or capable of growing, towards that image after which he made them that they might grow to it. The symbol of the consuming fire.... It was a revelation, but a partial one; a true symbol, not a final vision. Yea, the fear of God will cause a man to flee, not from God, but from himself; not from God, but to him, the Father of himself, in terror lest he should do him or his brother wrong. For this vision of truth God has been working for ages of ages. For this simple condition, this apex of life, upon which a man wonders like a child that he cannot make other men see as he sees, the whole labor of God’s science, history, poetry, was evolving truth upon truth in lovely vision, in torturing law; and for this will the patience of God labors while there is yet a human soul whose eyes have not been opened, whose child-heart has not yet been born in him.